Grand Theft Auto IV is a 2008 open world action video game published by Rockstar Games, and developed by British games developer Rockstar North. It has been released for the PlayStation 3 and Xbox 360 video game consoles, and for the Windows operating system. The game involves a separate timeline and world than its predecessors, starting the fourth "era" in the Grand Theft Auto series, and is set in fictional Liberty City, based heavily on modern day New York City. The game follows Niko Bellic, an Eastern European war veteran who comes to the United States in search of the American Dream, but quickly becomes entangled in a world of gangs, crime, and corruption. 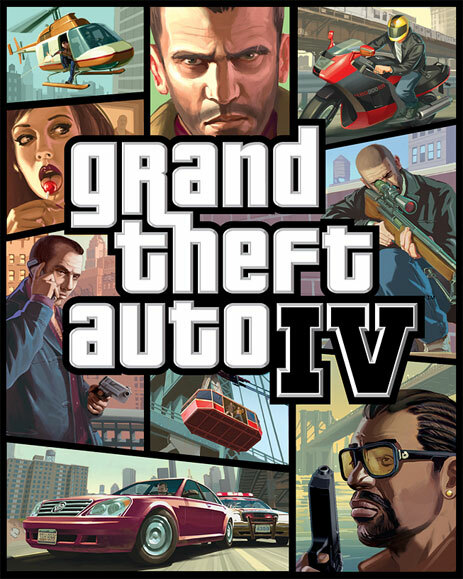 Like other games in the series, GTA IV is composed of elements from driving games and third-person shooters, and features "open-world" gameplay, in which players can interact with the game world at their leisure. Grand Theft Auto IV also features several online multiplayer modes. Two expansion packs have been developed for the game, originally released as downloadable content for the Xbox 360 version throughout 2009. Both The Lost and Damned and The Ballad of Gay Tony feature new plots that are interconnected with the main GTA IV storyline, and follow new protagonists. The two episodes have been released together for all platforms as a stand-alone game called Grand Theft Auto: Episodes from Liberty City. A bundle that containt both the original GTA IV game and the Episodes was also released, titled Grand Theft Auto IV: The Complete Edition. The 2009 handheld game Grand Theft Auto: Chinatown Wars revisited the Liberty City of GTA IV. As the first game of the critically acclaimed series to appear on seventh generation consoles, Grand Theft Auto IV was widely anticipated. A major commercial and critical success, it broke industry records with sales of around 3.6 million units on its first day of release and grossing more than $500 million in revenue in the first week, selling an estimated 6 million units worldwide. As of September 2011, the game had sold over 22 million copies. Grand Theft Auto IV won numerous awards from both gaming and mainstream press, including several recognitions as Game of the Year, and is in the highest ranks on several professional game critic review-aggregating websites. Quite like its predecessors, the core gameplay of GTA IV consists of giving the player a large, open world environment in which to move around freely. On foot, the player character can walk, run, jump, climb over obstacles and swim, as well as use weapons and perform basic hand-to-hand combat. Players can steal and drive a variety of vehicles, including automobiles, boats, helicopters, and motorcycles. Grand Theft Auto IV takes advantage of Natural Motion's Euphoria engine, which combines artificial intelligence, bio-mechanics and physics to make open, non-linear environment allows players to explore and choose how they wish to play the game. Although storyline missions are necessary to progress through the game and unlock certain content and parts of the city, they are not required, as players can complete them at their own leisure. When not attempting a storyline mission, players can free-roam, giving them the ability to do activities. Side missions such as locating and destroying criminals in the police car database or participating in street races can keep the player occupied for hours. This game files nothing ... update this file plzz ..
need to produce any serial key? in order to play the game? No... precracked...or crack may be present there... enjoy!! !